The New York welcome is famous. Charles Lindbergh was paraded up Broadway under a deluge of ticker tape after flying the Atlantic solo in 1927. The Apollo 11 astronauts received an even grander reception 42 years later when they returned from the moon. But no one was ever given a welcome like the one that Lafayette received in 1824. He was returning, one last time, to see the country whose independence he had fought for almost a half century earlier. His tour was a sensation. Echoes of it can be seen across New York to this day. Lafayette had first come to the New World in 1777 when he was nineteen. A fabulously wealthy nobleman, Lafayette received an honorary rank of major general from a Congress eager to court help from the French government. On September 11, 1777, British forces were giving George Washington’s army a drubbing at Brandywine Creek outside Philadelphia. Desperate, the commander sent the teenage general to rally troops. Lafayette rushed into combat, was shot in the leg, but still managed to organize an orderly retreat. Washington, who was childless, came to look on the orphaned Lafayette like a son. After the war, Lafayette returned to France, where he instilled the ideals of America into his own country. Amid the turmoil of the French Revolution, Lafayette was forced into exiled, captured and imprisoned for five years by the revolution’s enemies. When he was finally freed, he retired to his estate, known as La Grange, outside Paris. By 1824, Lafayette was sixty-seven. President James Monroe invited him to come to America to kick off the celebration of the fiftieth anniversary of the nation’s founding. The Nation’s Guest, as he was officially designated, arrived in New York City in August 1824. His secretary August Levasseur wrote that it was “impossible to describe” the Frenchman’s arrival at New York harbor. He estimated that 200,000 people turned out to cheer Lafayette. A parade took him to City Hall. He attended a gala banquet. And this was just the opening of a welcome that would go on for thirteen months. Adulation that frequently reached the level of hysteria greeted the French hero wherever he went. He was so much in demand that he had trouble maintaining his taxing schedule of public appearances. The citizens of every town wanted to see him. Orange Hotel where Lafayette was feted at a banquet, the militia had trouble controlling the crowd. The mayor finally had to bring the guest out onto a balcony to satisfy the onlookers. He didn’t have time to stop at Poughkeepsie, but a huge crowd waited there until the wee hours to cheer him as he sailed past. At Clermont he visited Robert Livingston, son of the patriot family, and greeted people who came from all around the area. He landed at “the little town of Hudson” where arches and a public banquet awaited. But Lafayette had to miss these festivities in order to reach Albany in time. He received another outpouring at the state capital. Across the river, where only two or three cottages had stood during the days of the Revolution, Lafayette was amazed to find the prosperous new city of Troy. Lafayette spent the winter at the nation’s capital before continuing on his journey the following spring. At many stops he greeted men he had fought with so many decades earlier, whose faces he still remembered. The timing of Lafayette’s visit was fortuitous and explains much about the extraordinary outpouring of patriotic emotion that greeted him. Lafayette was the last living major general of the Revolutionary War. His arrival reminded citizens that the men and women who had created the country were on the verge of passing into history. At the time, partisan rancor was increasingly dividing Americans. The presidential election of 1824 had been one of the most vicious ever fought. It had ended with the House of Representatives handing the office to John Quincy Adams even though he had received far fewer votes than Andrew Jackson. Lafayette was a hero with neither party nor sectional connections. Divided citizens could put politics aside and celebrate the great achievement of their fathers and grandfathers, of which Lafayette was the living face. Leaving Erie, Pennsylvania, Lafayette entered the far western end of New York State in early June 1825. Rushing to keep up with his itinerary, he passed bonfires in tiny villages where the whole population had waited through the night just to see his carriage pass. At Fredonia he was met by a “magical scene.” Folks there had hung thousands of candles from houses and trees. A huge crowd greeted him. “Mothers presented their children to him and requested his blessing for them.” A band played, bells and cannon erupted in joy. Lafayette hurried to Boston for the June 17 anniversary of the Battle of Bunker Hill. 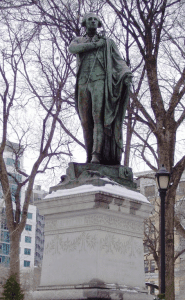 At the ceremony, Daniel Webster described Lafayette was the missionary of the American cause, the man who spread “the electric spark of liberty” to the world. 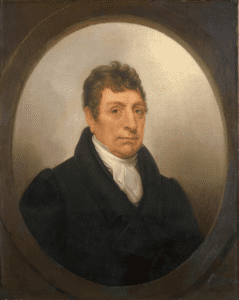 After a tour of New England, Lafayette again returned to New York. He traveled to Brooklyn, where he helped dedicate the Apprentices’ Library, a charitable institution for children, which later evolved into the Brooklyn Museum. Lafayette pitched in to help the crowd of boys and girls to places where they could see the ceremony. One whom he lifted in his arms was a six-year-old named Walt Whitman. The poet remembered the occasion fondly all his life. The same scene, the same silence, marked Lafayette’s departure from Washington in September. When he died nine years later, both houses of Congress were draped in black for a month. Around New York State today, we can still see the traces of Lafayette’s visit. A town south of Syracuse is named Lafayette. A large township between Cayuga and Seneca Lakes is called Fayette. The village of Fayetteville is east of Syracuse. The town of LaGrange, near Poughkeepsie, honors Lafayette’s estate in France. Buffalo has its Lafayette Square, New York City its Lafayette Street. Both Albany and Troy have Lafayette Parks. In the northern reaches of Dutchess County, a tiny hamlet, barely more than a crossroad, was named Lafayetteville to commemorate the visit. Lafayette was a symbol of those better angels. In his day, he did inspire Americans to remember, to overcome their differences, and to celebrate the republic whose blessings they enjoyed. Photos, from above: Portrait of Lafayette, courtesy The Metropolitan Museum of Art; Statue of Lafayette in New York City’s Union Square courtesy NYC Parks Department; and The hamlet of Lafayetteville by Jack Kelly. Excellent Article. The voyage up the Eastern seaboard in 2015 of the replica of the French ship Hermione which brought Lafayette to the United States in 1780 was designed by the French people and government to remind Americans about Lafayette and his importance. Thanks so much for sharing this story of Lafayette’s return trip in 1824 much of which is news to me. Thank you for this added information that we never learn in school! This I will pass on to our children in History Camp next year. 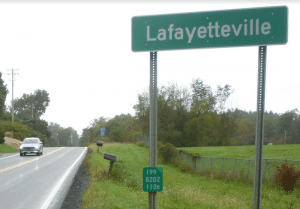 Since we have a LaFayette and a Fayetteville village near Syracuse, you can see that he did influence this part of New York State. I went to Vassar College in Po’keepsie/Arlington in Dutchess County and live in Tennessee now. 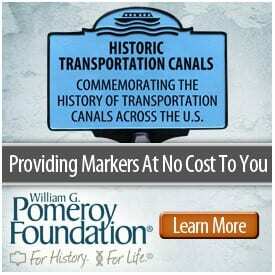 This article provided a great way to learn the source of so many US place names. Now I know where the name “LaGrange” comes from;-) There’s one in Tennessee, too, a beautiful little village east of Memphis and just a couple of miles north of the Mississippi line. It’s a favorite staging area for Civil War re-enactors, I’ve been told. Tennessee pronunciation of the general’s name has its own variant: La-FAY-ette! I grew up on Lafayette Ave. just outside Peekskill, NY. At one time it was called Jockey Town Rd but was renamed because local history has it that Lafayette and Washington rode their horses up and down it while planning battles in the area. An excellent accounting of of the Marquis Lafayette’s return visit to the United State in the early 19th century may be found in the Personal Memoirs of Colonel Benjamin Tallmadge, who personally met with Lafayette during his visit. Readers will not be disappointed. 3) Washington himself and his many subordinates (such as Hamilton, Tallmadge and Lafayette) did what ever they possibly could to promote high morale in the Continental ranks…mainly by working closely together. This being said, debacles did occur within the American military machine (e.g.-The Conway Cabal, Benedict Arnold’s defection to the British side, Gen. Charles Lee’s dubious and premature retreat at the Battle of Monmouth in 1778). But Washington’s outstanding leadership ability leading from example inspired most of his men to stay loyal, even during the most trying times. Washington’s and America’s resolve was enough to see us through to a very hard fought (and bloody) victory. “…of leading from example…” I meant to say. Wonderful article, Jack! 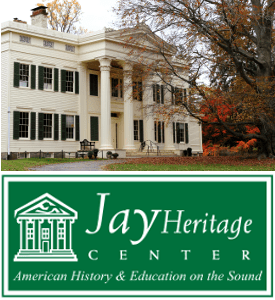 My information on Poughkeepsie differs in that he was honored with a breakfast and early morning visit… see 1954 DCHS Yearbook at this link: https://dchsny.org/lafayette but I look forward to learning more as we approach the 200th anniversary! This was an excellent article. Mr. Kelly did a very fine job here, with both his research and writing.